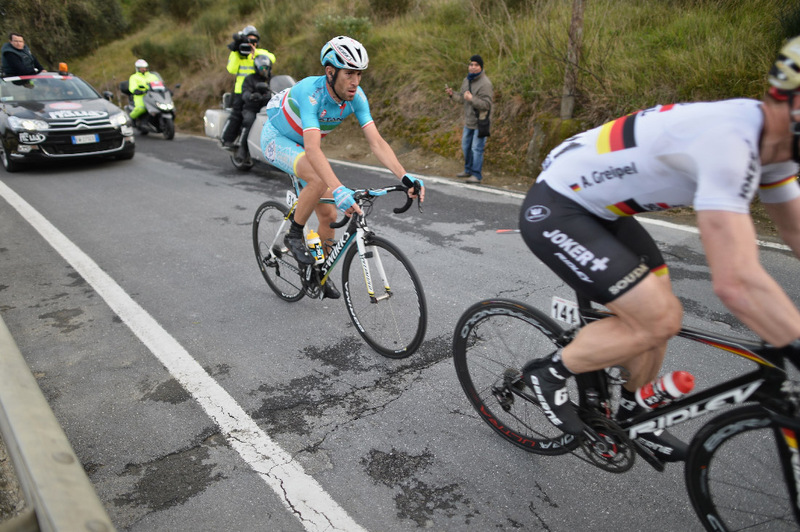 albumciclismo: Milano Sanremo 2015. Drops and over. Milano Sanremo 2015. Drops and over. The memory goes to the moment when me and Angelo had to say goodbye. We were sit inside the car, in a small car park inside a small town in the Lombardy plain and our ways were going to separate after the long one we had together, from Milan, to Sanremo. And below, pieces of what we saw that day. Adam Hansen just step out from team motorhome. A long day just began. Bernard Eisel smiling at start line. It's a wet day and the finish line is 300 km far away: good actor! It's three years in a row that this race is showing her worst face the early morning in Milan, when riders get down from buses and allign for the starting. It's rainy, and wet, and cold. Will to talk is few, but anybody has his's own duty in the pocket, and for two hundred men the to do list is huge: three hundred kilometers on a bike. The early break is on route after few kilometers. Eleven braves are met by few people on the roads. It's cold and rainy; better stay home and waiting for the TV live. Water drops from the sky in huge quantities. The road is a pool and the bunch passes on it, splashing dirty mud in any direction. Lights are on by vehicles, it's last winter day, but it's a strong goodbye. The Lombardy plain covers the first half of the race. The weather is miserable and the riders have to deal with the worst of their job, when elements are against them. A group of eleven is out till the first kilometers of race and the group is in control. Our trip is behind them. We pass from small towns, cities and contryside. Lunchtime coming, but we don't feel hungry because we are too involved in what's next game. Favorites are hidden inside the group. Covered like anyone else it's almost impossible to recognize them. 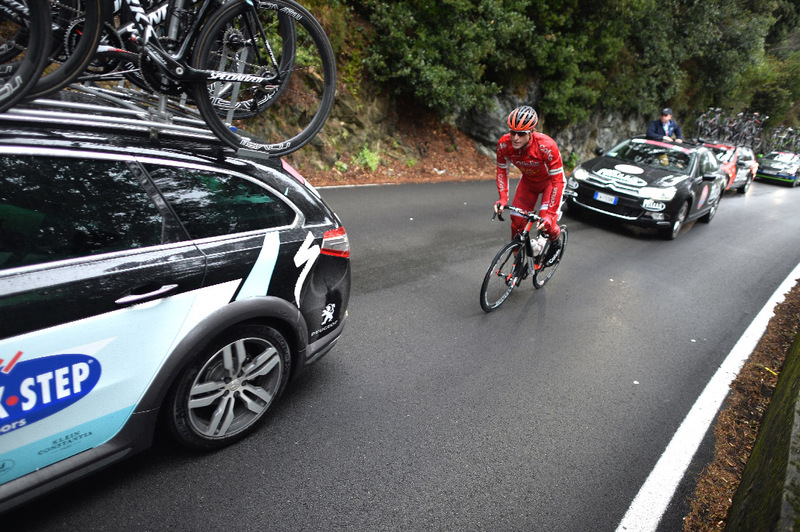 Here we shot Cancellara, staying quite in the full storm. The race hit the Riviera but the storm continue. From Milano doors to now has passed already four hours, but the weather hasn't change and there's no sign it can. Mechanical of just a push? it's not the weather for Cav, who won this race in a sunny day in 2009. When the race hit the seaside usually the weather improves, but it's not the case, today. The rain continues to drop from a dark grey sky. There's no chance to imagine anything else than this. Our dresses are wet, our shoes are wet. We protect the cameras with anything we can. Definitively this is not the Primavera people talks about. Crossing pools on road can be dangerous, for riders and for spectaros as well. 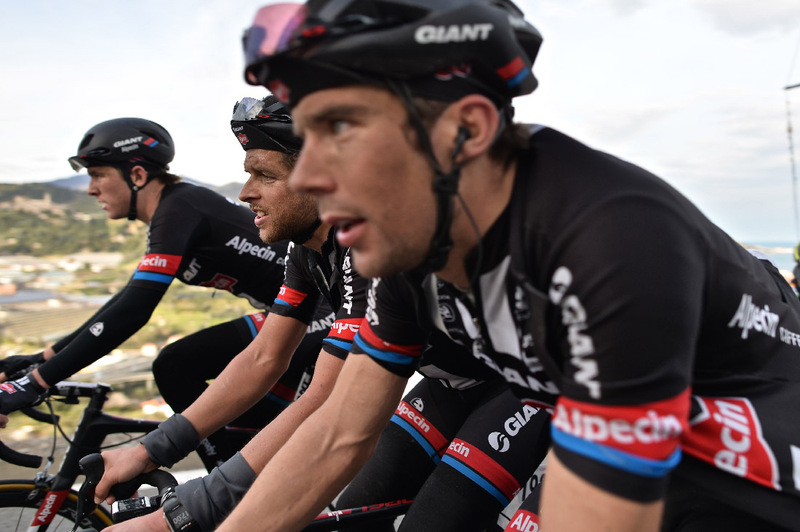 The bunch proceed in block, sometimes the speed is remarcable. No chance to avoid them. The weather start to improve once we are on Capi. It isn't raining anymore and from west we may guess some sun light. Savona, Finale, Albenga. The coastline heads southwest now and when we come to the Capi the rain is over. We are counscious that the long trip is going to finish soon, but we are part of it and we cannot understand that any passage is a passage less. The break is going to be catched and the big ones are moving ahead of the peloton. Most probably it will be sprint, but someone will give his best to avoid it. Road is almost dry on Poggio, the sea behind is quite, a dim light is illuminating Geraint Thomas attack. It seem just another day from the one we were having just an hour earlier. It's the key moment. Hearts are pulsating without control. It's the ten minutes heart attack that this race always offer. Olives trees are watching. Geraint is at his limit and he is writing a beautiful page on Poggio. He will fail, just because he was out with Oss for too long before this climb. Good move, man. Geraint Thomas against the others. Geraint Thomas attacks on the Poggio, his move is a good one. He cross the hardest and still the pace is remarcable. People on the road watch at him and scream, but he can't listen. Motos are passing him, but he can't watch them. Geraint has just passed last bent, but someone is already in sigh of him. Greg is on catch, but it's a late one. Bunch is in sight and will easily close the gap. Poggio is a matter of timing. 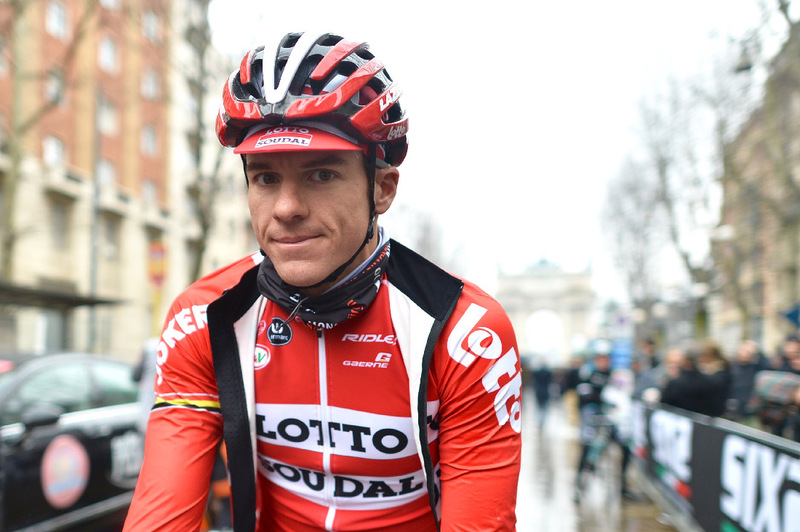 You can't attack to early (as Thomas did) or too late (as Van Avermaet). The key poin is located one kilometer from the top and anyone know it but almost no one has enough power to drop all other. For those one who say Poggio it's easy to climb. They can't know that their team mate is crossing the finish line first. Just exhausted by a too long day under the rain. 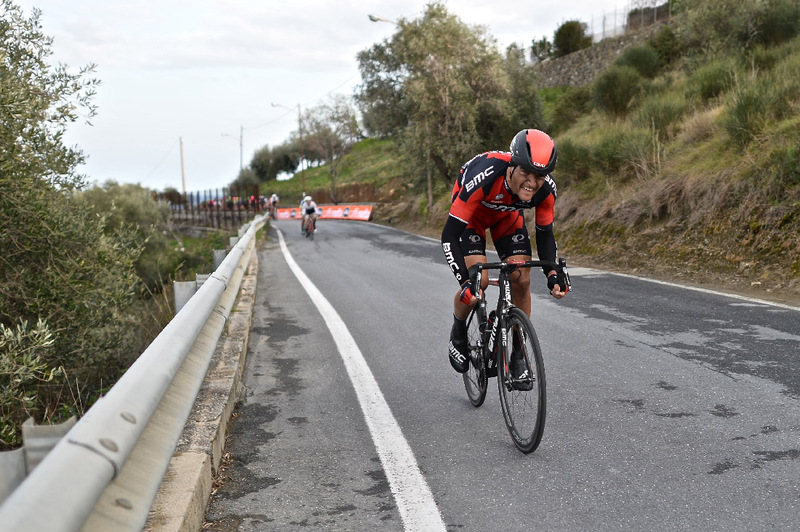 Sebastien Chavanel climbing Poggio with front inner ring. The Bussana vecchia town lays on the other side of the valley, and the sun is touching the top of the hills. Sunday afternoon, it's over till next year. Now that the sun shines is to late for the first, but not for the others that are still climbing the hill above Sanremo. They are exhausted, at the end of a very tough day with the only wish of a warm shower. On the other side of the valley the thiny white town of Bussana Vecchia watch the last rider climbing. The name of the winner comes from a a TV broadcast propagated from a portable device. It's really over, now the drops are a distant memory.